What's going on with Brexit? Discussion in 'Western Europe' started by The Rhetoric of Life, Mar 12, 2019. Hard Brexit means no trade deal with the EU. The EU isn't the world. Got America saying they're ready for a deal if the EU doesn't scare us into a deal. How long do you think it will take to hammer out a deal between the US and the UK, 2 years, 3, or 4. This is Donald Trump saying US can do a big trade deal with UK. You might have not heart, but the Idiot in chief says a lot without understanding what he says. North Korea, that is easy. Trade Wars, that is easy. 3 to 4 years at the minimum, don't you agree. EU wants a deal to suit the EU, say hello to European Court of Justice and an open door for all EU migrants. But sure ... the little UK negotiates with the huge US a trade agreement. Certainly at eye level and fair for both in result, because the UK has the great power to prevail here against the will of the USA. How did Trump once say? For me, a good deal is just a deal that the other one is not satisfied with ... because when the other one is satisfied, there was more for me to achieve! What do you think the US wants a deal that does not suit it ? Ask Mexico and Canada about it. By the way, the EU has done all the trade deals, for 40 years, for the UK. The UK does not have the man power or the experts any more to negotiate those deals. It showed in the negotiations with the EU about Brexit. The US would roll the UK over the barrel so fast it would not be funny. Oh, really? What happened to "they need us more than we need them"? I thought the German car manufacturers would insist we'd get a decent deal? Looks as if those damned unicorns won't be caught!! What das MAGA mean, USA first and at a very bright and sunny day everybody maybe second. And so you agree that these Brexit Clowns are dreaming a wild nasty nightmare at least with their blabbering about trade deal with the US. Thank you mate! Very much so, the USA is not a social club and when it comes to be the bully and advantage taker, it is first class. The UK would be a junior partner, behind Mexico and Canada at best and both those countries have treaties with the EU. Totally agreed ... and this is fact! But this is unfortuantely only one of many facts, which are not known / not wanted to be known / ignored by Brexit people... and so they dream very often dreams, which will never this way happen as they wish it! I saw yesterday by chance a small report about a shepherd in Wales. His sheep not only serve for the wool, etc., but also the necessary landscape care. That's why he gets money from the EU ... and more ... that's why someone else got a job through the EU. He is gone with Brexit and there is no longer any money from the EU. Once a year, the surplus male animals are sorted out and then end up as mutton, especially to southern Europe. In future ... with a No Deal ... 10% tariff on import into the EU is due ... why his customers will buy here partly elsewhere and within the EU. One may smile about this small and certainly rather insignificant example ... but it is an example of what will happen in general with a no deal! Or does one seriously believe that the USA will then prefer to import UK mutton as replacement? And as for the Commonwelath named as replacement for the EU by some ... well ... looking at New Zealand and Austrlien with their huge flocks of sheep ... probably not at all and they would then become a hard competitor for the UK! Australia and New Zealand are TTP members, by the way. There is one more thing about Hard Brexit. There are 1000s of small business, which have a business model built on free access to the EU. If they loos that free access they will have to close and lay off their employees, besides the probable bankruptcy. Mail order business would have the same fate, suddenly they would face custom regulations and naturally tariffs. The damage to small business would be devastating and hardly recoverable. But than the bright side, they would have their country back, buuuuuuuuhhhhhhhaaaaaaaaaaaa. Most people who voted in favor of Brexit, and many of those who are still in favor of it, have not only shown that they have no idea about the EU itself they are so abusive about, but also that they have no idea what that means everything for them and their country and what it all has consequences ... or they play it all down as little things. If Brexit happens at some point and it's the No Deal variant ... which is anything but predictable and safe at the Comedy Show in the House of Commons ... and then these Brexit advocates suddenly start over all the evil consequences that are suddenly there to cry or even blame the EU again for it, then I will laugh so fervently full of glee about these clowns as I rarely laughed in my life! Why? Because they are against better, possible knowledge, and against every warning before, just they alone are guilty for it and no one else but them! Goodbye to the NHS? What kinda things do you think trade deals cover, public services?????? Theresa May refused rule out opening up the NHS to American firms in a trade deal with Donald Trump. ... Members of Parliament have now been charged with the responsibility to think of another deal. I'm not doing this news story justice I feel as it's all that the domestic televised news is telling me. I think there's like five options they're voting from including just doing what the Prime Minister wants, Brexit without a deal, 2nd referendum or calling off Brexit, and the vote will be multiple choice. Groups have been putting forward different options for the UK's future relationship with the EU. Several are based on the assumption Mrs May's withdrawal agreement with the EU will be approved, albeit with changes to the controversial Northern Ireland backstop. Common Market 2.0: The UK would remain in the single market by rejoining the European Free Trade Association (EFTA) and staying in the European Economic Area (EEA). A "comprehensive customs partnership" would replace the Irish border backstop plan. It would accept continued freedom of movement but with conditions. Malthouse compromise plan A: Mrs May's withdrawal deal but without the backstop, which would be replaced by alternative arrangements. 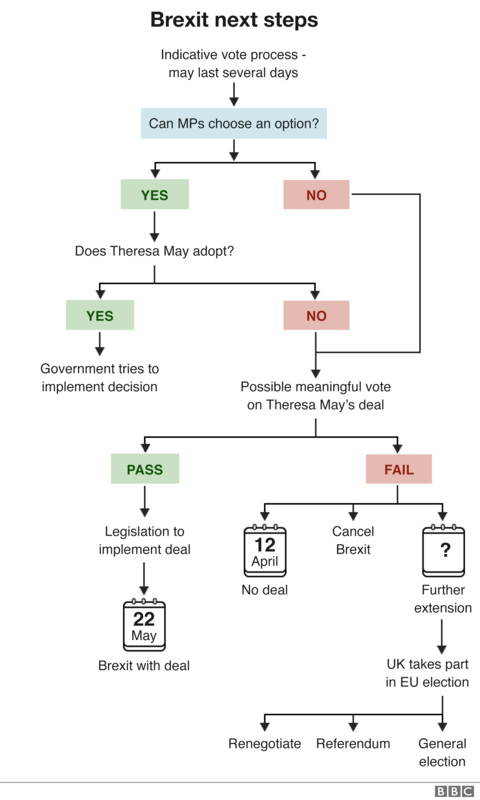 Revoke Article 50: If the government has not passed its withdrawal deal, MPs would vote on a no-deal Brexit two days before the UK's leaving date. If MPs reject no deal, the prime minister would have to cancel Brexit altogether. According to a copy of a business motion released by Labour's Hilary Benn, there will be about five hours of debate on different options. So Jacob Rees-Mogg has changed his mind and will vote for Britain to become a vassal state of the EU. You happy, Brexiters? Is this what you wanted all along? No, No, No ... 8 times NO, this is the result from yesterday's Comedy Show in House of Commons! Is there any need for more evidence of the inability of British policy in dealing with Brexit? Once again, most people agree only on what you do not want with a majority! When the hell comes the announcement from UK, what you want by majority? The clock is ticking ... and she's ticking louder and louder at all Brexit and all the things you do not want in the UK. Anyway ... I find it funny that this Brexit boss clown Boris Johnson finally drops his mask and proves that he really does not care about the Brexit. Monotonously as Foreign Minister, he fought against every deal and prevented him ... thereafter prevented as a deputy on. And now that Wonder Woman offers Therase to resign as Prime Minister on accepting the deal ... this total idiot suddenly is cool with the deal! You learn ... the idiot is all about to move into Downing Street No. 10 only ... the Brexit and Deal or No Deal, he does not care! If this joker clown actually becomes really your next premier, then you British have hit the bullseye of absurdity! But since then the topic Brexit will finally be done ... and also done with a deal, I have no problem with that .... and Boris Johnson is purely your problem then, with which you have to live on your own island. Actually, I have to thank the Brexit people ... because I used to be a big EU skeptic and critic, almost EU enemy! But you have converted me with your behavior and made me to an EU advocate! Thank you! And, despite this magnificent show of incompetence and inconsistency, you'll find that many Britons will still blame the EU. Pathetic! Only reasonnable solution now: UK negotiates to remain in the Customs Union. This option has been proposed by Ken Clarke ( a "remainer" and one of the most experienced and astute british politicians) and has been defeated by 8 votes only. But I don't think there is a majority in the British Parliament even for that = again a No! Could have French and German versions of God Save The Queen as well the English version and have people in Romania for example sing the English version? UK could afford it, no? I mean, UK paid for all the roads in Spain, I think, and propped up the currencies of Europe to make way for their Euro. What is going on with Brexit is that Parliament has again refused her deal - by 286 to 344 which means officially we leave in two weeks. Rumour is that May may try again next week. May has been threatening Brexiteers they may need to vote people into the EU Parliament. That being said, thank God. With this move and her promise to resign if they voted for it, it could have meant that a very hard Brexiteer took us out eventually on No Deal. Officially it is no deal or probably a long extension. Chances of another General election have apparently gone up.